The Eastern Military District’s artillery units have been armed with over a dozen ‘Tulipan’ (Tulip) mortars, designed to destroy heavily fortified field constructions. This is an effective and terrifying weapon that, over the past 10 years, has been practically absent from military units. These self-propelled units have now been reactivated. 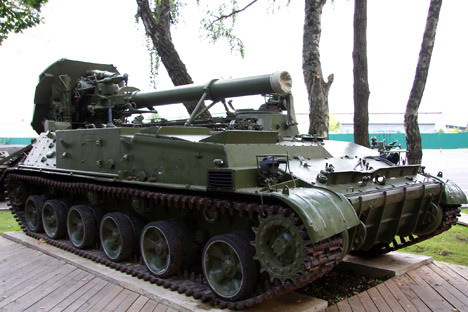 The self-propelled 2S4 ‘Tulipan’ mortars, of a caliber surpassing Western counterparts, had been practically removed from service, with around 430 of these weapons remaining in Russia, kept in storage at military bases. This is despite the fact that, in 43 years of service in the armed forces, the effectiveness of this weapon was never in doubt. The range of ordinance that the ‘Tulipan’ can shoot includes high-explosive, incendiary, guided, cluster, neutron and nuclear warheads, some of which are capable of hitting targets at a distance of about 20 kms. The ‘Tulipan’, with its 240-mm caliber cannon, is the largest from a series of self-propelled units given “flowery” names; ‘Gvozdika’ (Carnation), ‘Akatsiya’ (Acacia), ‘Giatsint’ (Hyacinth), and ‘Pion’ (Peony). The latest modern munitions are guided mines, which are part of the 1K113 ‘Smelchak’ (Daredevil) system. The structure of this system includes 240 mm command-detonated 3VF4 mines with high-explosive 3F5 shells and the 1D15 laser target designator and rangefinder, with 1F35K and 1A35I synchronization equipment. Powerful 134-kilogram mines of the Smelchak and Smelchak-M complexes, to increase their accuracy, have their targets “illuminated” by a laser beam in the later stages. The duration of this process is minimal, not allowing the opponent enough time to interfere with or prevent the destruction of the object. The shrapnel cluster from munitions of the 2S4 ‘Tulipan’ mortar is able to hit an area the size of four football fields. One shot from this powerful mortar totally demolished its target, making it inaccessible to any other artillery pieces. A special shell has been created for this powerful self-propelled mine, one that contains a nuclear charge. The main feature of the 2S4 mortar is the ability to fire it from the “maximum angle of elevation”. The specialty of this type of shooting lies in the fact that the special controllable mines can be guided by experienced gunners with such accuracy that they have the effect of high-precision aerial bombs. A crew of five men can deploy the 2S4 ‘Tulipan’ into firing position within minutes. This self-propelled mortar can swiftly change its location, after launching an attack against the enemy. High maneuverability and flexibility of the batteries, optimization of operations by crews of these machines using automating service processes, coupled with the absence of any need for manual preparation of combat positions, make the 2S4 ‘Tulipan’ suitable for use in military operations in urban environments and for assaulting fortified enemy positions. The 2S4 ‘Tulipan’ was used by the Soviet Army during the war in Afghanistan. Russian armed forces also used the destructive power of this mortar during the first war in Chechnya, destroying large concentrations of the enemy and pinpointed fortified targets, including powerful fortifications built by the terrorists on the Grozny Oil Refinery. Placement of the ‘Tulipan’ into service of the modern Russian Armed Forces is a consequence of the recently announced plan to increase the number of artillery units. These are being created, but for now are being armed with old material equipment, until the deployment of serial production of the new modern self-propelled ‘Koalitsiya’ (Coalition). So the most powerful in the history of nuclear artillery mortars, the ‘Tulipan’ got a second chance.